You are gonna need to do some pre requisites. First of all you are gonna have to separate and set your egg whites aside in a container at room temperature for 2-5 days, I recommend 5 days as they work out best. Next up you need to blitz your ground almonds as fine as you can in a food processor for about 2-3 mins, this will ensure your macaron come out nice a smooth. 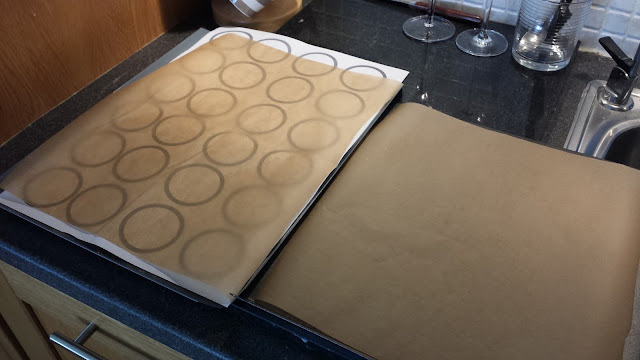 Also you need to line a baking tray with baking parchement and marked with circles. 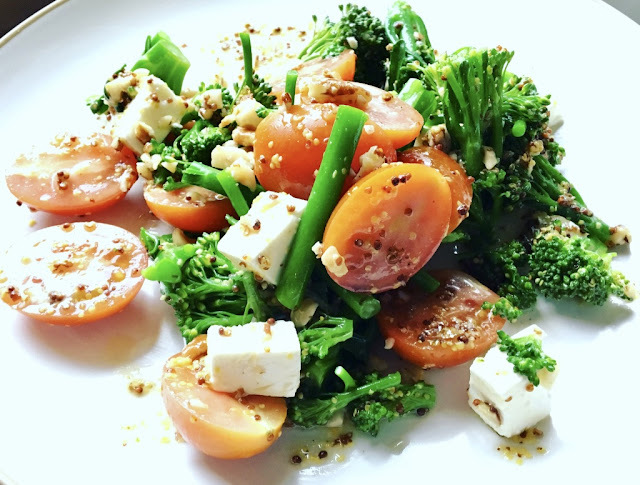 Add 112g of the egg whites to the above. Mix all together in to a paste, add your purple colouring and set aside. Now you want to boil 300g caster sugar and water together until it reaches 118c degrees, make sure to brush down the sides of the pan with cold water to prevent sugar crystallization. Whilst waiting, beat the other 112g of egg whites to soft peaks. Back to your almond paste, before we go further you should know you are gonna use your hands here. Take one handful of meringue and mix in completely to loosen the mixture. Next fold in with your hand the rest of meringue, be very careful not to over mix and in fact look at how I did it here before http://www.thecooksbelly.com/2013/08/mikado-macaron-my-baking-nemesis.html. Melt the white chocolate in a bowl set over a pan of boiling water. Once melted add the creme fraiche and bring together into a ganache. 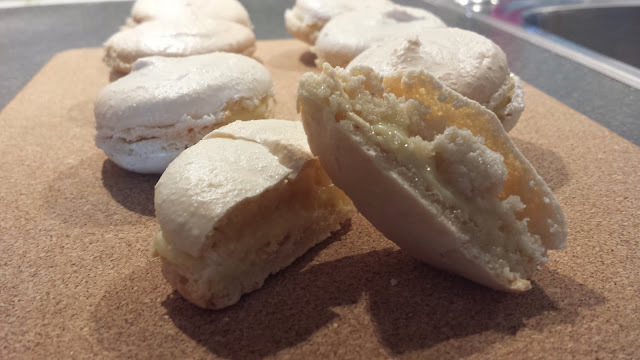 Match up you macaron shells to the right size. Pour the white chocolate ganache in to a piping bag and pipe around the base of a shell. 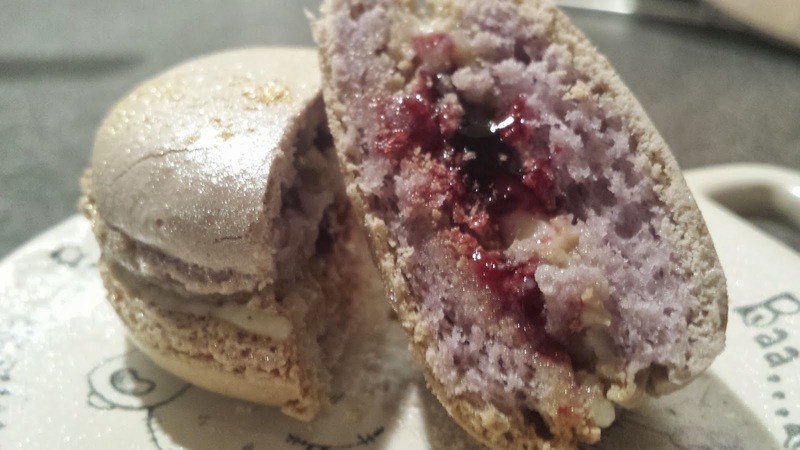 Add a blob of preserve to the middle and sandwich with another macaron shell. 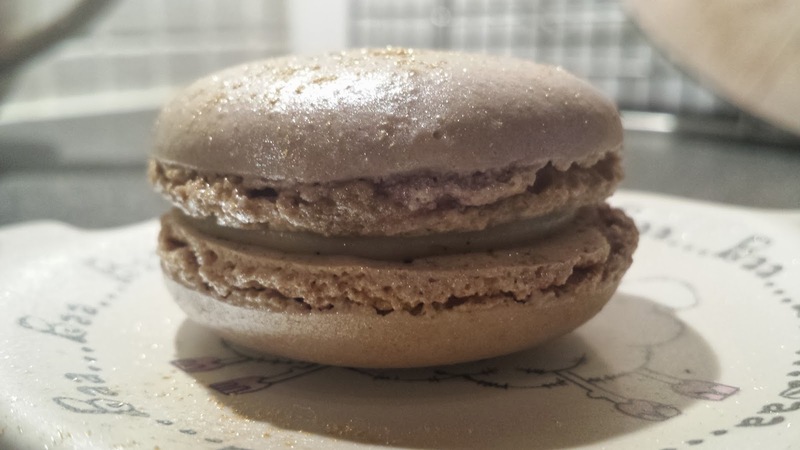 I topped each macaron with a spray of lustre and gold glitter.